My latest op-ed, title above, appeared in The Virginian-Pilot Thursday. 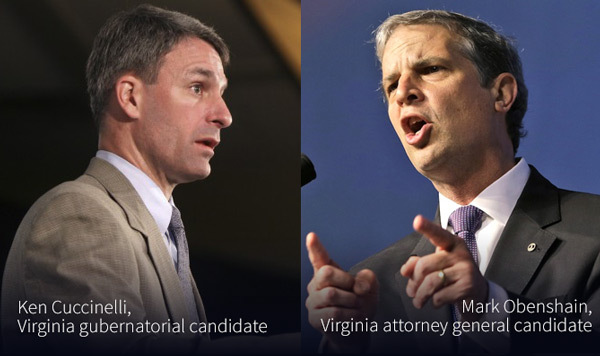 Of course, the two candidates the title refers to are Ken Cuccinelli and Mark Obenshain. It seems illogical that the polls show Cuccinelli losing while Obenshain is keeping the race close. As I said in the article, Obenshain is Cuccinelli 2.0. I guess the voters simply aren’t aware. On social issues such as abortion and homosexual rights, Cuccinelli not only takes stands we find objectionable but pursues his divisive agenda with a stridency that was unbecoming in an attorney general and would be unbecoming in a governor. We do not support abortion for any reason at any time and have embraced bans on late-term abortions, for instance; we remain troubled by Cuccinelli’s approach to personhood and to regulations on clinics. We disagree with Cuccinelli’s opposition to Gov. Bob McDonnell’s transportation package. How, exactly, does Obenshain differ from Cuccinelli on any of these issues? He doesn’t. But obviously that didn’t concern the RTD because they mentioned none of these issues in their gushing endorsement of Obenshain. Thursday morning saw a similar act from The Roanoke Times. After endorsing Obenshain Wednesday, based on his promises to not be like Cuccinelli, that paper refused to endorse in the gubernatorial contest Thursday. Nevermind Obenshain’s record – “the causes the Republican has chosen to champion have often been disappointing” – because he promised to do better. It’s no wonder the voters, many of whom have never heard of Obenshain before now, don’t know his record. Let’s not make that mistake. The reason is that the money coming in for TMac is about five times what Cooch has gotten. TMac has been, after all, nothing but a political fund-raiser. Those he raised money for are paying him back, and those who gave money to him for other candidates are now giving it to him for his own candidacy. Obenshain’s opponent does not have that backing. That may explain the voter’s side of things – in that more money translates into more TV ads – but not the editorial boards. I would like to know how you think you have been “burned” by Cuccinelli. Did he not faithfully defend the laws of Virginia — even those he disliked? Filing suits? That’s what the AG is supposed to do. What unjustified suits did Cuccinelli file? Drawing a paycheck while campaigning? Is there any duty of his office he did not fulfil during that time? Should every governor and a.g. resign to run for re-election, too? The memo to state colleges only re-iterated State law in response to queries to his office. That is his job. Of his “strong-arming” health regulations, I know nothing. Please explain. And you’ve never had a typo, right, Warren? You know full well I meant Mann. The Mann situation wasted resources. The suit against the Affordable Care Act, and EPA regulations wasted resources. He has draw a full paycheck while working just 26% of the time. Nice work if you can get it. If you were correct on the memo, then Gov. Bob McDonnell wouldn’t have had to override it, would he? He bullied the board over the regulation of abortion clinics. Show me one instance of him defending a law he didn’t like.